This is a page dedicated to ms Marco Polo cruise ship accidents and incidents reports and news updates. What you will find here is information of cruise ship Marco Polo run aground accident, and cruise passenger death incident. MS Marco Polo is one of the most famous old cruise ships, from the small fleet of Cruise and Maritime Voyages (aka CMV Cruises). On February 14, 2014 (between 1-2 pm local time) stormy weather caused a Marco Polo cruise ship passenger death. It happened in the waters of the English Channel. The ship was en route to Tilbury (London) returning from a 42-day Transatlantic cruise to South America (round-trip from London, departing Tilbury on Jan 5). During this incident, another passenger suffered serious injuries and was airlifted to hospital. As Marco Polo rocked side to side, a large wave (“freak wave”, as they call it) crashed through a window in one of the onboard restaurants and injured several passengers. The most serious injuries were sustained by 2 elderly guests – an 85 yo male and a female in her 70s. They both were quickly airlifted to hospital ashore, but the man died later. On this voyage, total number of guests was 735 (mainly British), crew was 349. MS Marco Polo experienced a ran aground accident. It happened in Norway on March 10, 2013, while sailing on 14-night Norwegian “Northern Lights” cruise departing Amsterdam to UK (London, the port of Tilbury). Accident location was a remote fjord located north of the Arctic Circle. After leaving the port of Sortland (in Vesteralen) and under the command of a local Norwegian pilot she hit an uncharted underwater rock resulting in hull damage. No injuries were reported among all 1117 passengers/crew. The ship immediately returned to the port of Sortland to undergo a detailed damage assessment by divers. After about 23 hours for inspection and some small hull repairs the ship was cleared to continue with the cruise. The Sortland’s Port Director (“harbour master”) Hugo Naess has expressed his surprise over the grounding accident, pointing out that more than 2200 different ships use the port of Sortland per year and such incident has never happened before in his 15 years of service. Incident occurred at low tide (the ship’s draft/drought is 26,8ft/8,2m). Direct result was a 40cm/1,3ft slit and a leak in one of the ship’s ballast tanks. the area was mapped to update charts. The Norwegian Coastal Administration (NCA) is the responsible party for all navigational charts of this region. Due to the accident there was an itinerary change – the scheduled visit to Andalsnes was missed. ms Marco Polo first sailed down to Stavanger, but the dry-dock there was too small for the ship. CMV line decided to disembark all passengers in Antwerp (Belgium) where Marco Polo entered into dry-dock (March 15) for a thorough hull inspection and permanent repairs. From Antwerp all passengers were transferred to UK (Tilbury/London) via the Channel or were ferried by coach. March 17 cruise was cancelled. Passengers of the two cancelled cruises received a full refund, with additional £50 PP and 25% off any next cruise in the CMV’s 2013/2014 UK sailing program. 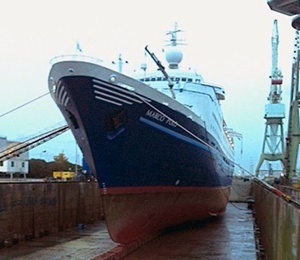 The Marco Polo cruise ship grounding incident resulted in minor damages, and one of the “strong” reasons for that is her strengthened hull – this almost 50-year-old vessel is originally constructed by its USSR owners with a thicker hull to withstand contact with the Arctic’s broken ice. Visit the front page for all ms Marco Polo cruises (itinerary, dates and prices information). We wish safe future sailings and only happy experiences on this amazing “charmingly old” ship!